Namibia, a land of contrasts, is loved by visitors for its striking desert landscapes, massive sand dunes, rugged mountains and almost 1000-mile long coastline on which skeletons of long-dead animals and shipwrecks lie scattered. 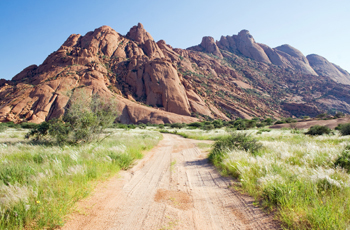 Many regions of Namibia are of interest for visitors. In the south, Africa’s largest canyon, the Fish River Canyon offers not-to-be-missed views. Sossusvlei’s salt and clay pans, which are surrounded by massive red dunes, are a highlight of the Namib Desert. While Windhoek is the country’s capital city, Swartkopmund is a much-loved seaside holiday destination. The dome-shaped Brandberg Massif stands out from the flat Namib gravel plains and in the setting sun it appears to glow red. Elevations over 2000 metres can also be experienced on the Central Plateau and Great Escarpment. For photographers and historians alike, the northern Skeleton Coast is a treasure trove of shipwrecks. For wildlife experiences, few locations compare to the world-renowned Etosha National Park or the Caprivi Strip, a narrow piece of bushveld that is sandwiched between the borders of Angola and Botswana. Interestingly, this unique area receives a significantly greater amount of precipitation than the rest of the country. While each region has something special to offer, the best time to visit Namibia depends on what you would like to see or, conversely, your planned travel dates will determin the best regions to visit at that time. 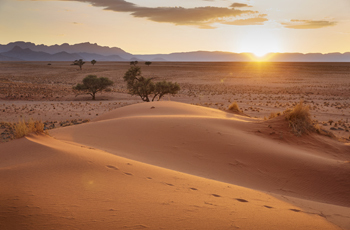 African Travel Gateway has designed Namibian tours and safaris that emphasise the country’s wild beauty, vast open spaces and desert landscapes to focus on the best that the regions have to offer. Whether you choose a guided or self-drive tour option, your experience of this country will be unforgettable. Browse our tours and safaris or contact us directly for tailor-made Namibia tour to complement your travel itinerary.